A $30 MILLION State funded Pick My Project community grants initiative, which has been a hot topic for individuals and community based organisations for the past four months and the public voting window to choose which projects are given a share of the money is about to close. This means Victorian’s across the state have only a few more days to vote for their top three projects. The initiative aims to distribute funding across the state into projects such as community events, repair cafes/ sheds, community gardens, art projects, urban landscaping, skill share programs and walking/cycling trails. Community groups, events and initiatives are part of what binds the residents of Warrandyte and surrounding communities together, so it is no surprise that within five kilometres of the township there are 18 project proposals. The $30M needs to be distributed evenly across the State, but with 2299 projects being put up for public voting — more than half of that focussed around Melbourne — competition for funding is going to be tough. The participatory budgeting platform this initiative uses means that the popularity of a project is determined by the community who would use it. In theory, this ensures funds are assigned to a project the community thinks will bene t them the most. Victorian’s can each only vote for three projects — the Diary has outlined a selection of the projects proposed in and around Warrandyte. Local artists Eugene Howard and Kate Hill are collaborating with Parks Victoria, Nillumbik Council and the Wurundjeri Land and Compensation Cultural Heritage Council Aboriginal Corporation to seek funding to restore two buildings designed by Landscape Architect Gordon Ford and Architect Alistair Knox, situated in Laughing Waters Reserve. Once restored, these buildings will be used as a site for an Artist in Residence program, aimed at bringing in a diverse range of national and international artists, as well as cultural programs, talks, workshops and exhibitions for the local community. Eugene is also hoping to forge a stronger relationship between artists, the local community and the Wurundjeri, which will bolster the existing strong artist community in Eltham, Warrandyte, Kangaroo Ground and Bend of Islands. “The project has been developed as a co-use space between the Wurundjeri and Residency Projects,” said Eugene when he spoke to the Diary. Eugene went on to explain the Wurundjeri wish to use the site as a place for “inter-generational cultural knowledge transfer, bush food/medicine education, access to the nearby eel traps and significant cultural sites in the reserve surrounding the buildings”. “We will also develop smaller projects that will include public language classes, walking events and recurring panel discussions around Indigenous arts and culture; we will grow our partnerships across the Shire of Nillumbik and up the Birrarung (Yarra) River to enable exhibitions and events to occur from the City of Melbourne to the Yarra Ranges. “We’re thinking of the site as an arts and cultural centre with a core artist-in- residence stream,” he said. The restoration of two buildings designed by iconic Australian architects, and an opportunity to further understand and strengthen the relationship between Indigenous and non-Indigenous Australians through art and cultural experiences, would enhance an already rich cultural gestalt. In May 2017, the Diary spoke with Chris “Chewy” Padgham, Assistant Scout Leader to 1st Warrandyte Scouts and long-time advocate of men’s health when he initially attempted to set up a Men’s Shed in Warrandyte. Chewy had conveyed how a lifetime working to support and improve men’s mental health had taught him that a space where men can work and chat around other men can help them deal with emotional stress in a healthy way, instead of trying to supress it, which often results in them either lashing out violently or completely shutting down and becoming disconnected with society. “My objective, which is the objective of every men’s shed really, is to have a place where men can meet and talk and share their experience and I think it will be a great thing for Warrandyte. “I thought that [a men’s shed] was a good opportunity to act as a catalyst and contribute something back to the community and there’s a lot of people that have been talking about it but not a lot happening so I thought I could get the ball rolling,” said Chewy. The major hurdles faced by Chewy in 2017 were a suitable location and funding. Chewy is hoping to secure $85,000 from the Pick My Project initiative, which will go towards leasing and converting an appropriate building. Warrandyte, Wonga Park and Park Orchards sporting communities have all put forward projects to improve the sports precinct in their respective towns. The Warrandyte Sporting Group is encouraging the local community to rally behind its proposed exercise trail to be situated at Warrandyte Reserve. The exercise trail proposal earmarked several sites for construction of the area, including an option for a single site between the tennis court and oval, a cluster of smaller and more focused workout areas located around the ground and a custom kit to be utilised in a flexible fashion. The site is designed to accommodate people of varying levels of fitness and aptitude with equipment specialising in strengthening, core exercise, aerobics and agility just to name a few. The trail would not require any maintenance and would utilise recycled plastics to construct environmentally friendly workout equipment. The project provides a casual and intensive fitness outlet situated in the heart of Warrandyte. Wonga Park are seeking $140,000 to install flood lights on the community oval which will allow local sporting teams to train at night which will greatly improve the use of the oval during winter. In Park Orchards, the local sporting group is in the process of negotiating with Manningham Council for an extensive redevelopment of the Domeney Reserve sports buildings. The club is looking for $84,000 of funding from Pick My Project to develop a community space at the reserve for dinners and social functions. Domeney Recreation Centre was earmarked for development as part of the Domeney Reserve Management Plan, endorsed by Council in October 2017. But in the July 2018 council meeting, sporting groups and other users had proposed an alternative development plan for the Reserve facilities, plans which would require additional funding, on top of that which Council had already assigned the project. Funding for this social space at Domeney Reserve is not just the first of many steps into the development of the facilities at Park Orchards but would also give the community some much needed community function space, something which they currently lack. These projects are a small sample of the many funding worthy community projects which have been put forward. Other local initiatives include: erosion control on Anderson’s Creek; resurfacing of the Anderson’s Creek Primary School oval; Suicide prevention seminars; a sensory play space at Kangaroo Ground Primary School; upgrade of the picnic area at Jumping Creek and a new play space at Park Orchards Community House. Voting criteria requires the participant to reside within 5km of the chosen project and to be 16 years or older. 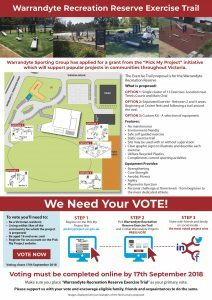 If you are interested in voting for any of these, or looking to see all the other projects on offer, visit the Pick My Project website before September 17 and pick your projects. Project funding is scheduled to be handed out at the end of September.